Are you ready to discover The Fatigue Solution and make tiredness, brain-fog and low energy levels a thing of the past? The Fatigue Solution is an amazing new book addressing how women and men of all ages can take control of their body's energy-generating systems, using proven science and the latest developments in research. You are ready to future-proof yourself against low energy levels and mental fog - forever. You are committed to embracing a regular routine that will raise your energy levels within a matter of weeks. You realise that there is a lot more to the concept of energy than yet another caffeine fix. You want to learn how to eat optimally for high energy levels from someone who walks the walk, and has been doing so for over 25 years. You want to understand the role that proper supplementation can play in restoring your energy and eliminating fatigue. You want to learn how to eliminate fatigue so that you can live your life to the full, with the energy you need to enjoy every aspect of this amazing experience called life. 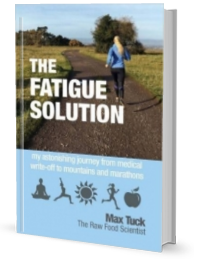 The Fatigue Solution is an exceptional publication written by Max Tuck, a Veterinary Surgeon, Health Educator and Health Researcher. With a bio-science background, she approaches all health concerns from a rigorous scientific stance. 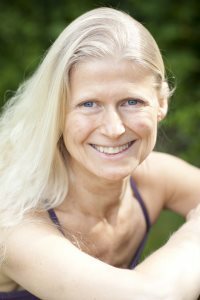 After being diagnosed with chronic fatigue in 1990, and refusing to become a medical write-off, she was able not just to reverse her illness but also to achieve many significant personal goals. Then The Fatigue Solution is for you! "You have Epstein-Barr virus, and post-viral syndrome – a type of chronic fatigue. Your immune system has crashed – unfortunately you have very few white blood cells remaining. You need to take at least a month off work. I would recommend that you go home and evaluate what you want to do with your life. You will have to accept that it won’t be the same as it was before. You need to realise that most people never fully recover from this. And you also need to realise that if you don’t rest and slow down, you’ll shorten your life expectancy." To say that I was shocked to the core is an understatement. As a result of my medical background, I knew exactly what was happening to me, and was also familiar with the frightening decline and increasing debility experienced by people diagnosed with this condition; many of whom, I had heard, end up in a wheelchair. My immediate instinct, as it has always been when anyone tells me that I can't do something, was that I would prove him wrong. Right there and then, my healing journey began. Initially, my source of reference was health magazines. Back in 1990 there was no internet and I had to jump through hoops to even get access to any medical texts on the condition. They all seemed to point to the same conclusion: that the condition had to be "managed" but that any chance of a cure was like asking for a miracle. All in all, I found it pretty frustrating. I’m sure you can relate to that. The first thing that happened was that I accepted that I had got myself into this mess in the first place; I had created my own demise. It was no-one else's fault that I was ill - I had absolutely created my problems by working myself into the ground, not taking breaks, not getting enough sleep and not eating properly, if at all. The medical profession had no answers for me. It was totally up to me to fix this. Via my thirst for knowledge and downright refusal to give up and die, I found out some interesting facts from health magazines. Chronic fatigue is much more prevalent in women and also in those who exhibit a "Type A" personality. What was this demographic doing that was causing such dramatic energy depletion, whilst increasing the risk of a life-limiting disease process? As it transpires, there are many factors that make a contribution to this complex illness. I was determined to consider them all, research their significance, and act upon them. The result of my failure to give up, and personal experimentation to find the solutions that I needed, are documented in The Fatigue Solution. 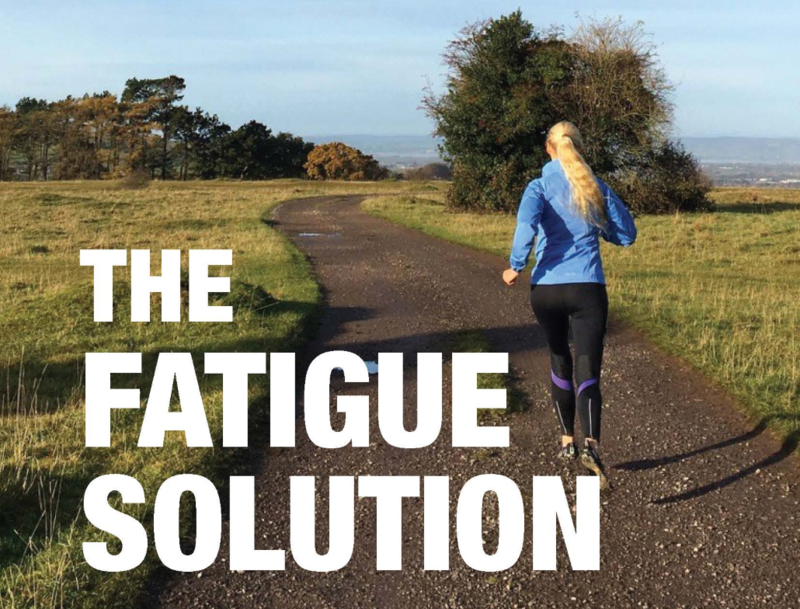 The Fatigue Solution has been created specifically for those who want to embrace all the factors that are now known to be essential for keeping energy levels high. The book covers the obvious ones that we’ve all heard of, but also opens the door to information on a multitude of health tips you might never have thought to be significant, and might never even have heard of. The Fatigue Solution is Max Tuck’s extraordinary contribution to those suffering a less than vital life. Her far-reaching depth of knowledge and exceptional experience allows her to speak from the heart and the head with total balance. What I love about this literary journey is the personalization when woven together with scientific fact presents an unchallengeable pathway to success. Brian R. Clement, Director, Hippocrates Health Institute, Florida USA. Wherever you are on the health and energy spectrum, you can start to benefit from all of the upgrades put forward in The Fatigue Solution. Perhaps you already eat an excellent diet. Find out the essential nutrients you might be lacking, even if this is the case. Oh, and in case you’re wondering if this book is for beginners or advanced scientists, be assured that as in all of my written work, I take complicated science and make it fully understandable for everyone. It’s what I’m known for, and in this book I have personalised a lot of the information. You'll learn a lot about me as well as yourself. In the introduction, I give you some details about my early life and why I developed my persistent personality. It's important, because it gives you an insight into my mindset and how I refused to let my illness beat me. In chapter 1, I unveil the reasons behind my shocking spiral into disease which led to the medical profession diagnosing me as an incurable mess. Can you risk becoming someone who suffers the same fate by pushing yourself relentlessly and not taking heed of your body's cries for rest? And whilst you might think that this is something that won't happen to you, were you aware that lack of energy is the most common reason that people visit their doctor, usually to be told that there isn't actually a specific remedy for this? Chapter 2 | What happens now? My personal story continues with my decision on where to go for the rest I needed, and to kick-start my recovery process. Discover how, by doing something that I had always enjoyed ever since I was a child, I could have made such a difference to my health at a time when I was at my most vulnerable. And find out how this, in turn, positively affected an important molecule which is known to be deficient in people diagnosed with chronic fatigue. Learning how to keep the levels of this substance sufficiently high could make all the difference to your long term energy levels. Discover the science behind chronic stress, what it had done to me, how it negatively affects the whole body, and how you can benefit from this information. Whilst searching for answers to my problems, I ended up buying a magazine in a supermarket one afternoon. In Chapter 3, you'll read about how one particular article in that magazine totally changed my eating habits overnight, and the science behind how that would have helped in my recovery. You'll learn about how your cells produce highly damaging molecules which can cause many problems later down the line unless your diet contains a sufficiently broad spectrum of protective factors. Learn more about the antioxidants you need to protect your nerve cells, and why isolated supplementation is not the answer. Your overall health and energy depends on this! Chapter 4 | What's up with my mitochondria? This chapter explains the presence of beneficial "aliens" in our cells. It describes how these unusual microscopic structures are responsible for more energy production that you might have thought possible, especially if the right fuel is provided to the cells. You'll meet the molecule which is known as the "energy currency of life", and how each and every cell in your body depends on this for its optimal functioning. In chapter 4 you'll also find out how to maintain adequate production of this substance. Your day-to-day energy levels depend on this - don't leave it to chance! Max has done it again! Another fantastic book packed with life-transforming information and practical tips on how to improve your health and wellbeing - forever. Reading her life story is both shocking and truly inspirational. Doctors need to read this! Chapter 5 | Fat chance! Fat is the enemy, right? Actually, no... This chapter explains exactly why, as far as energy generation and cellular health is concerned, not all fats are created equal. Learn which type you need and which type you must avoid for healthy cells and soaring energy. Find out how a particular enzyme, so vital for converting essential fats into important anti-inflammatory compounds, is inhibited by certain types of diet and lifestyle factors, as well as by some of the viruses involved in fatigue states. Discover which foods are the best sources of these essential fats and how they help to maximise your brain function. The integrity of your very thought processes absolutely depends on this – ignore it at your peril! Do you sometimes wonder if you are doing enough exercise, and what type you should be doing? What if you're too tired to get moving? Well, here’s some essential reading as I share with you the shocking facts about inactivity and how it might interfere with not just your health and fitness levels but also your brain function. Discover the science behind the benefits of exercise, even if you've been diagnosed with a fatigue condition. Find out how long it takes, and using what type of exercise, to start to feel the benefits. Read about my own experience with exercise, and where it led me. You'll be amazed! Chapter 7 | How are your cofactors? Ignore your cofactors and you can unknowingly be putting the brakes on energy production. I certainly was, before I found out what I needed to be eating to fight fatigue. The energy-generating picture cannot be considered complete until you embrace these 6 essential vitamins, 4 important minerals and other antioxidants. They are each as important as the next; learn about how they interact with each other and why you can’t just concentrate on one or two. Discover which delicious foods are a treasure-trove of these energy-giving superheroes. Read about the mineral that is involved in over 50 known biochemical reactions in the body and be amazed by how it acts together with your "energy currency" molecules. Discover which other important mineral works together with your master antioxidant systems to bring about excellent health, and the environmental factors that interfere with this. With modern-day technologies and everyday stress to our mind and body, chronic fatigue syndrome and stress-related illnesses are unfortunately becoming far too common. The Fatigue Solution gives support and proven facts that we can overcome and prevent these symptoms with natural remedies and healthy life changes. A must-read for anyone suffering from this debilitating condition. Bernardo Moya; Chief Inspirational Officer of The Best You. What's the big deal about gut health? Since most of the DNA in your body is not yours, it stands to reason that we have to consider our gut's "friendly bacteria" as a possible ally in many of the health challenges we might face. Learn about how our microbe colonies are easily disrupted, and which foods you must never eat if you want to have healthy gut microflora, and indeed mitochondria. Read the fascinating information about how the "happiness molecule" is created in the gut, and how certain medical conditions can cause its depletion. No wonder they call the gut "the second brain"! Chapter 9 | What about detox? Detox has to be one of the buzzwords of the 21st Century, but there are many who write it off as a fad. But could it be that the elimination of toxic wastes and accumulated environmental chemicals will slash your likelihood of fatigue? It appears that it can. Read the fascinating research which indicates the toxins and chemicals that cause the most damage, and how we are exposed to them. Understand the importance of the liver in detoxification - not just once, but twice! Learn how you might be genetically predisposed to tiredness, which important antioxidant this could affect, and what you can do about it. You'll even discover how your dentist might be involved in your energy levels, or lack of them. Don't miss this! Max is someone who combines expert scientific knowledge with practical implementation and advice. Her books and personal guidance have helped me massively in broadening my knowledge and channelling her guidance into my own healing power. Mark Bryant; author of Exhausted Entrepreneur and CEO of The Energise Academy. Technology is great, but what if it were slowly killing you? What if it were undermining your health at a cellular level, depleting your energy reserves and altering your body's natural electronic signature? It's not as far-fetched as it sounds, and you can read about the potentially disastrous consequences in this chapter. Learn which part of your brain can sustain significant damage as a result of mobile phone use. Discover a simple (and cost-free!) technique that could have you feeling better in a matter of minutes, and the delicious foods that can give you the dietary protection that you need. Keeping your energy levels high throughout the day depends on this. What do you have to do or experience to know that you have shaken off the debilitating shackles of fatigue for good? In this chapter, I go into full detail of how I went from medical write-off to mountains and marathons; how I rejected exhaustion and rediscovered life. What goals did I set for myself, and why? What challenges did I face, and how did I overcome them? It's an insight into the mindset of someone who loves a challenge and will never give up. You might not want to push your body to the limits that I have, but I hope that you will enjoy this autobiographical part of the book, as many others have done. I’ve got it covered... Whilst I was researching for The Fatigue Solution, I came across some excellent books published on the subject of energy depletion; after all, this is a much written-about condition. However, none seemed to put everything in the one place. That’s what makes The Fatigue Solution different from anything you might have read before; in addition to all the essential information outlined above, I’ve included 10 of my favourite quick and easy energy-boosting recipes for you to enjoy. Simple, wholesome, nutrient-rich, energy-giving food that will immediately set you on the path to better health and strength, and, in time, supercharge your life! Wrapping up, you won’t want to miss the unique “A day in the life of a fatigue-fighter” section, starting on page 133. It walks you through a high-energy day from the moment you wake up to the moment your head touches the pillow again. It’s as if I’m right next to you, guiding you through your day as you embrace all the concepts outlined in The Fatigue Solution, powering up your innate healing mechanisms and giving your precious cells exactly what they need to generate all the energy you need to enjoy life to the full! Max Tuck takes us on a journey of discovery, highlighting what can happen if we don't listen to our bodies, and how to overcome and recover from the lowest points to the highest peaks. This book is inspirational, and a must as we journey through life. As I’m sure you’ve now realised, The Fatigue Solution is no ordinary book. And by reading this far, you’ve shown that you’re no ordinary health-seeker. You know there’s got to be a better way to increase your energy levels than the current paradigm. You appreciate that your doctor might not be aware of all the latest developments in nutritional science that fight fatigue. If you are ready to learn how to free yourself from the shackles of low energy, brain fog and just "not feeling right", this is the place to say “YES”.